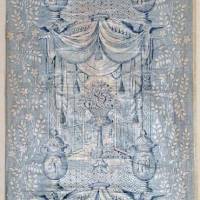 A very fine c. 1810 Eng­lish roller print­ed cot­ton in blue on white with a repeat­ed pat­tern of fash­ion­ably draped open win­dows, flow­er­ing bas­kets and Chi­nois­erie urns. Design called ​“Open Win­dow.” ENG­LISH AND AMER­I­CAN TEX­TILES FROM 1790 TO THE PRESENT (1989)/Mary Schoeser & Celia Rufey; P. 58, figs. 41 – 3.